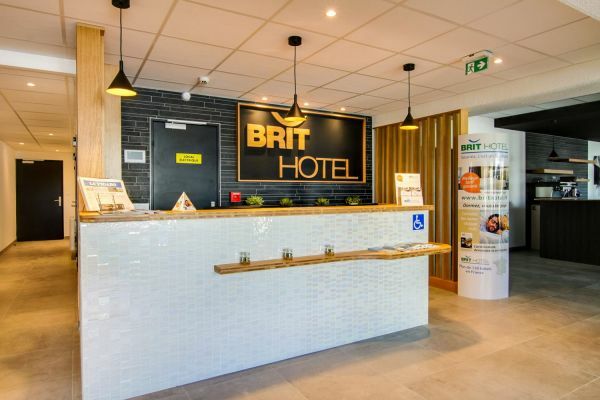 Welcome to the Brit Hotel Reims - La Neuvillette! Only 10 minutes away from the center of Reims, our hotel is a great spot for tourists and business travelers. Check in at any time: our 3-star hotel is open every day 24/24! Leave your car in our private parking for free. The Brit Hotel Reims- La Neuvillette has 72 comfortable rooms of different types: double, twin, family or communicating rooms (ideal for family trips). A baby crib is available upon request. Our hotel also has 3 disabled access rooms. 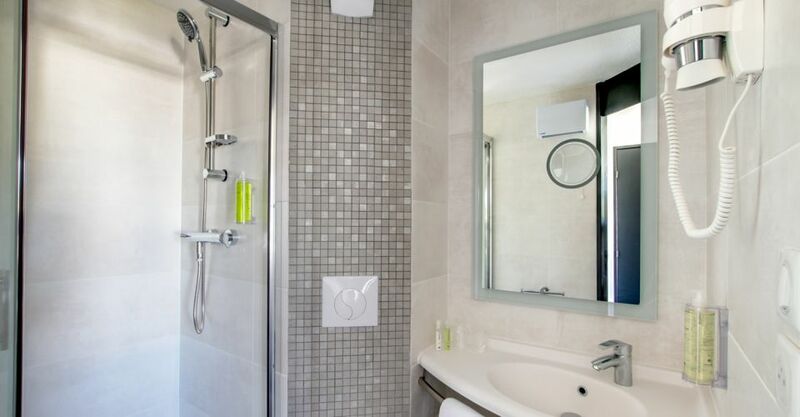 Each room has all the necessary equipment for a successful trip: a high-quality mattress with a blanket, a private bathroom with a shower or a bath tub and a hair dryer, a telephone, free Wi-Fi and a flat screen TV with Canal +. Start the day on a healthy and delicious note: each morning our breakfast buffet provides you with carefully chosen fresh and local products. A great way to discover our regional specialties! Have lunch or dinner at our restaurant, where you’ll taste a refined cuisine in a warm and friendly atmosphere. Stop by our bar for a drink and enjoy the lovely terrace! The Brit Hotel Reims- La Neuvillette is a great venue to organize your professional events, thanks to its 2 meeting rooms. Your pets are welcome in our hotel for an additional fee of 5 euros. What are you waiting for? Start booking your stay in our Reims- La Neuvillette hotel right now! I always book because of the very comfortable beds and good bathrooms. Ideal location for a stop over en route to the Alps. Friendly staff, spotlessly clean and comfortable beds. Continental Breakfast provided variety of cereal, bread, cake, cheese, ham and fruit with yogurts and juice. Typical self service but no problem with this- quality of produce was good. Plenty of parking. Recommend. For one nights stay, it was clean, warm and comfortable. I missed having a hot drink on arrival in the evening. It would have been nice to have a kettle available with tea and coffee in the room but enjoyed the breakfast. His hotel suites our purpose of an overnight stop on our travels to Strasbourg from UK. The room was basic but clean and adequate for our needs. Dogs are allowed so this was why we chose it. We had a basic breakfast in the morning but again it's all we needed. It's located in an industrial estate but has a few restaurants nearby. We are in the Buffalo Grill which was okay. I would stay for an overnight stop again if I need to. Most friendly welcome. The lady behind the reception desk worked in the restaurant also and did both jobs very good Rooms extremely clean! We stayed at the Brithotel only one night, as a stop over during long journey. The hotel room was big enough (2 adults and 2 children), bathroom clean and beds comfortable. The only thing that was lacking in the room was a hospitality tray - no possibility to make a cup of tea or coffee, also there was a small bottle of water provided, but only one for four people booking the room. But that is the only criticism. The breakfast was satisfying and with good choice of products. Over all we can recommend this place, as we were very satisfied with service and people. Lovely hotel.. easily accessible by car on the outskirts of Reims. Rooms were a high standard, modern and clean. Beds were extremely comfortable! !